“Here comes another one! What’s our name, sweetheart?” I was greeted by cheery folks at the sign-in table for the Newcomers Club Welcoming Meeting the moment I sighted them set up outside a conference room at Fess Parker’s DoubleTree. “I’m here for The Independent : ” had scarcely left my lips before I was escorted past coffee, tea, and various finger foods to welcoming handshakes that led me right to the president of the Newcomer’s Club, Eve Senn, a wide-smiled, vibrant brunette with a plume of orange chrysanthemum pinned to her suit, who warmly invited me on in. 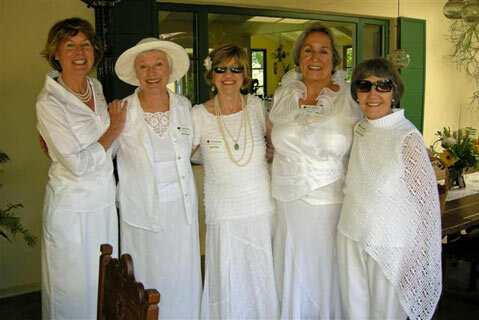 The Newcomers Club was founded in 1955 and has fluctuated between 400 to 700 members since. Membership is $100 for singles per year and $150 for couples – a fee that goes toward the maintenance of monthly newsletters and other group goings-on. The Newcomers was established to help those new to the area get to know the community, form friendships and business connections, and chiefly, have a good time. 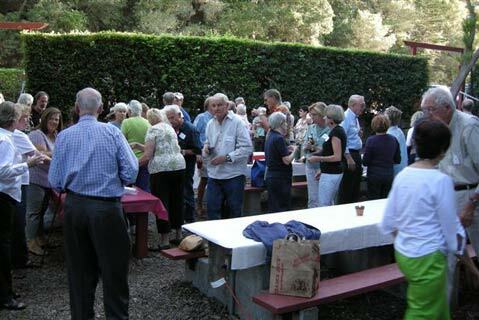 It’s a social group for those 21 through 80-something (though there’s no age cutoff), and they’re always doing something enviable, like enjoying the view from another member’s Santa Barbara mansion while sipping merlot from a Santa Barbara vineyard, or just kicking it at a local bar on a Friday night. Members have to pay for their personal expenses (like the food consumed at a restaurant) during activities or events, of which they have as many as 30 a month. All events are open to everyone, and they rarely stray far from “enjoying wine, company, and hors d’Åuvres.” My kind of people – a very sociable bunch from all over the world, literally. One of the few requirements of Newcomers is being new to the Santa Barbara area. Graduates at the polo fields. “Have some water, have some coffee, take a seat, hear about our club.” Senn directed me to an open seat and began introducing the committee members, who are in charge of organizing social gatherings. The microphone was passed around to each committee leader, who gave a short explanation of what they do. To name a few, rhere are the TGIF committee, the Cheers committee, and a Young Ones committee, for the 20-, 30-, and 40-year-olds, but not exclusively. 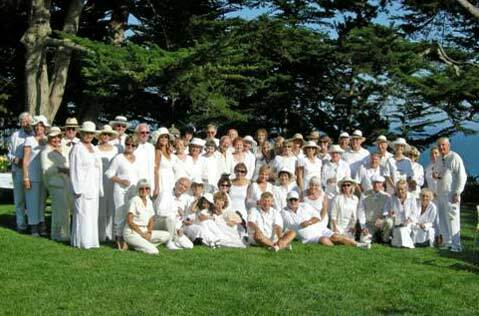 The Young Ones generate activities that may appeal to the younger members of the Newcomers, but, for example, a few more mature Newcomers attended the committee’s most recent outing, a Land Shark cruise around Santa Barbara. “We don’t have a French-speaking committee yet,” Senn, who was born in Kenya, announced after the committee presentations, “but if you’d like to, you can start one! We have quite a few French speakers with us.” I’m a born and bred Texan, “recycled” here to enjoy the beach and the mountains, just the same as everyone in the conference room that day; it’s no wonder to me why Santa Barbara attracts such a diverse group of people, but in truth, I didn’t expect them to be so nice. “I paint sensuous women,” Jeff corrected, reclined in his chair with a boot over one knee and hair to his shoulders. “And,” he continued, “if you want to know anything about Studio 54 in the ’70s and ’80s, just ask me.” He was at the right place at the right time, he explained to me. I couldn’t help but think that the people in that room were at the right place at the right time as well, right then, right there. 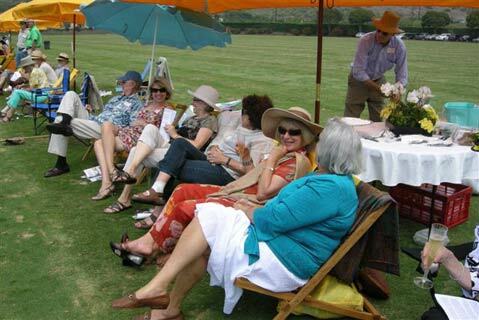 What a better way to meet interesting, sociable people after moving to a new county of wine, sea, and sun? Of course, everyone already has two things in common: being new to Santa Barbara and wanting to get involved in the community. 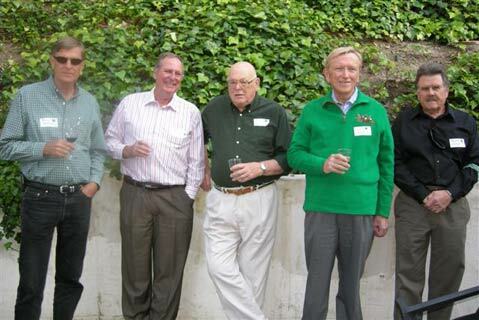 Some of the graduates enjoying a St. Patricks party. Newcomer memberships only last for two years, unless you serve two terms on a committee, in which case you can stay in the club for another year. Thankfully for many Newcomer members, they have the option to “graduate” to the Graduates Club. The Graduates Club, founded by Ellen Lily seven years ago, is a more mellow extension of the Newcomers and a way to keep in regular contact with a bit of a bigger social circle outside the circle of close friends the Newcomers members become. “I couldn’t handle the drop off the social ladder,” Lily explained in an interview, when she saw the end of her time as a Newcomer approaching. Within a week of her envisioning it seven years ago, the Graduates was born. The club boasts 240 to 230 members and usually plans around five activities a month. The Graduates also have holiday parties, like the Holiday Dinner Dance at a yacht club, or their traditional New Year’s party on The Channel Cat, one of their classier events. They have Christmas sing-a-longs, visits to culinary schools, and outdoor activities, although Bob Miles (a board member of the Graduates) joked that they haven’t had a hang gliding activity yet. Lily readily agreed, smiling, requiring me to take another look at these two lively senior citizens and wonder: Were they joking? graduates at a Great Gatsby party. “We all just like to get together,” Miles explained cheerfully. For both Miles and Lily, their favorite part about being a member of the Graduates is interacting with the people involved. “It really is surprising how many friendly people you meet,” Lily said, especially when first coming into one of the most beautiful cities in the world. Meeting people through a group as amiable as the Newcomers, “recognized as one of the premier organizations of its type in the country,” according to the Newcomers Web site, might have something to do with that. See sbnewcomers.org for more info.